Here is the second trailer for this epic conclusion to the best Batman trilogy of all time. Really looking forward to this one! 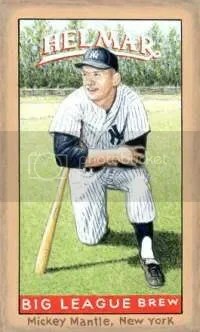 Monty Sheldon is one of the better known sports artists in today’s hobby. After graduating from the Joe Kubert School of Cartooning and Graphic Art in Dover, New Jersey, he went on to become one of the early employees at Dark Horse Comics. 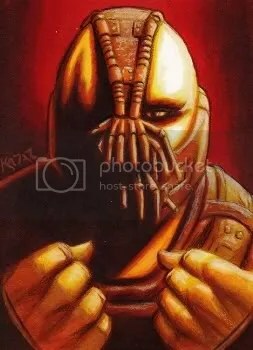 After leaving Dark Horse Comics in 1998 he went on to pursue a career with his own artwork, specializing in popular sports figures. Sheldon is mostly known for his famous Artballs that feature incredibly detailed paintings of some of baseball’s most popular players. 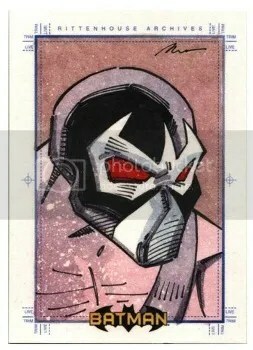 He also does artwork on cigar boxes, hockey pucks, and most recently he has been producing his own line of sketch cards. 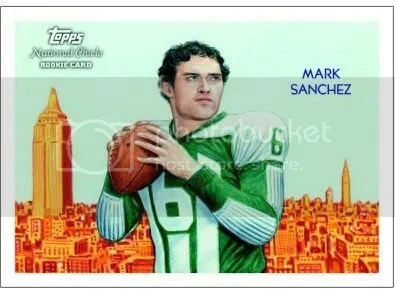 Later this year you’ll see his work featured in 2009 Topps National Chicle Football too. After seeing some of his awesome sketch cards, Mr. Sheldon was nice enough to answer a few questions about his artwork and what upcoming projects he is currently working on. When did you learn that you wanted to approach being artist as a career? I have drawn, sketched or doodled my whole life. Being raised on a farm left a lot of down time during my youth to allow me to contemplate many a blank piece of paper. What is the most difficult part of capturing an image on a sketch card, baseball, hockey puck, and/or cigar box? It can be difficult to recreate the faces of popular atheletes and/or a specific pose that is etched into the public consciousness, such as Willie Mays’ 1954 World Series catch or Hank Aaron’s 715th home run. 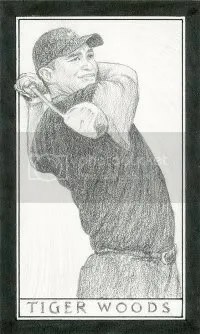 In sketching or painting a famous event or sports figure you have to be very precise in capturing what they looked like. If your off, even by a smidge, it will be obvious to the person who ordered the card or painting. Growing up, who were some of your biggest influences in art and sports? In my youth it was all about comic book art, I even went to the Joe Kubert School of Cartoon and Graphic Art after high school back in the mid 1980s. While attending that school, I was very close to New York city which allowed me to explore the many and varied museums and galleries it had to offer. One of the greatest and most influential exhibits I witnesed was the Viennia 1900 show at the Modern Art Museum in 1986. I was able to see close up the paintings of Gustav Klimt, Egon Schiele, & Oskar Kokoshka along with how art permeatted the Viennises society. Art touched everything in their lives from their silverware, textiles, furniture, house design, you name the item and there art was. In regards to sports, as a kid growing up during the 70’s in Ohio it was hard not to like the Big Red Machine which of course is still the greatest baseball team ever :). No bias, of course. Of all the pieces of artwork you’ve created, what is your favorite and why? 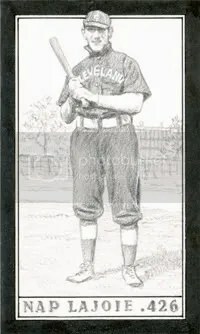 I don’t really have a favorite, there are of course pieces that I like better than others and I have always been partial to anything having to do with Rube Waddell. The first baseball, Helmar Card and cigar box I painted each featured “the Sousepaw”. The Moe Berg image I created for the series two Helmar set that shows him with his finger in front of his lips in the “shush” pose is one that I have always liked as it captures the mystery that was Moe Berg. Who have been the hardest players to draw/paint and why? I have always struggled to capture Roger Maris‘ likeness. I think that it is in part because his hair and skin are both so fair and creating the contrast between features is really difficult to do and still maintain a good resemblance. Who is the most requested baseball player(s) collectors ask you to paint? When I first started painting the balls in 1998 it was Mark McGwire, but since then Mickey Mantle has outpaced any and all requests. What is it like seeing your artwork on trading cards? It was very similar to seeing my art show up in a published comic book. Comics and trading cards were both childhood passions and my ambition then was to create my own comic books and my own set of trading cards. It has been both humbling and gratifying to see childhood aspirations come true in my printed artwork. Besides the new 2009 Topps National Chicle Football, what other artwork have you done for major card manufacturers? I had a total of ten printed cards appear in the Helmar series 2 (2007) and series 3 (2008) card sets, mostly I create one-of-one pieces. Currently I am finishing up with the hobby’s very first all hand-painted, 1/1 card set done in conjunction with Helmar(2006-09, 120 cards total), and I started what is believed to be the hobby’s first 1/1 sketch card set with this year’s Sheldon’s Sketch Card Champions. I have been auctioning off 3-6 cards each week on eBay. That set will be comprised of 240 cards by the end of this year. I will be creating another set of sketch cards for 2010, the size of that set will be determined. Do you do anything special to help prevent people from counterfeiting your sketch cards? Like many artists I rely on the presentation and performance portions of copyright law. Once a piece has been put on display as an original, one-of-one creation , the art is forever tied to me. In terms of printed works, the corporations take care of that. Do you have a personal collection? If so, what does it consist of and what is your favorite piece? As mentioned earlier, I like to collect all things Rube Waddell, which is easy because there isn’t much available–at least not in my price range. If you ask my wife (and she would be glad to tell you), the ghosts of my misspent card and comic collecting youth still linger en masse in the studio. Starting on October 1, Monty will be auctioning off his 8 Men Out Sketch Card Subset commemorating the 90th anniversary of the Black Sox Scandal. Below you’ll find the schedule for when each card will go up for sale. This is something a little different. 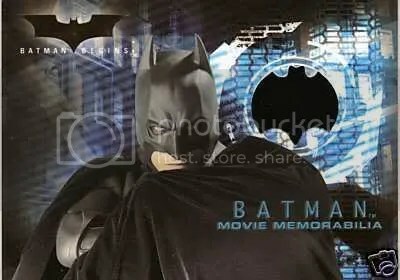 This is a 2005 Batman Begins Authentic Used Cape card from the movie. I thought I would use this today because I just saw The Dark Knight last night and it has to be the best Batman movie ever. Enjoy!! !